This Downloadable Kit Is Available for Only $99.00. The Pastor’s Class Kit consists of a Leader’s Guide, a Student Workbook, and a PowerPoint Presentation. Importantly, all three elements of this kit are fully editable. So, you may now brand and refine this kit for your unique ministry context. Your Campus License permits you to make unlimited copies of the Leader’s Guide, Student Manual, and Power Point presentation for use exclusively on your ministry campus. Please refer to the Licensing Privileges and Limitations below for more information. E-Church Essentials, LLC grants a site license to the purchasing organization. This license permits the purchasing organization to edit and modify the Pastor’s Class Kit curriculum, both Word documents and PowerPoint files. This site license also permits the purchasing organization to make unlimited copies of the Pastor Class Kit, modified or in original form, for use solely within its campus, or within a secure e-learning platform operated and controlled by the purchasing organization. The purchasing organization is responsible and liable for all mis-use of the Pastor’s Class Kit, according to, but not limited to, the following prohibited uses: The organization may not post the curriculum within a non-secure website, nor may the organization offer the curriculum (modified or in its original form) as a downloadable asset from a website or blog; the organization may not re-sell any curriculum based in part or whole upon the intellectual property developed by David A. Posthuma of E-Church Essentials, LLC; the organization may not distribute the curriculum for use by other ministry organizations who are not directly controlled by the original purchasing organization, as well as organizational extension entities (i.e., satellite ministries, church plants, etc.) who do not function on the same campus as the original purchasing organization. 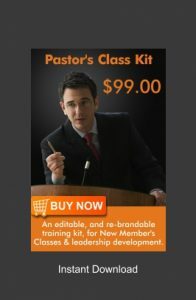 E-Church Essentials, LLC, and its owner David A. Posthuma, retain full legal rights to all intellectual property presented in this Pastor’s Class Kit, whether used in part or in whole. All federal copyright laws, rights, and privileges apply, copyright 2017.